GALION — Growing up, Galion Police Officer Tim Johnson didn’t have many pets. “We had a couple of dogs over the years, but they were smaller in size,” Johnson recalled. That minimal experience has surely made becoming Galion Police Department’s K9 officer, who is in charge of a much larger breed of dog, an adjustment in many ways, both professionally and personally. Basco, a Belgian Malinois, has been on the job with Johnson for a few weeks and having him as a part of the department has been beneficial, without question. Johnson spent a few weeks in training, working one-on-one alongside Basco before bringing him home to Galion. And while he has shared Basco’s commands with others at GPD, he has asked them not to be used unless necessary. While on duty at the station with Johnson, Basco is generally free to roam about and spend his time with whomever is there. There is certainly no shortage of attention for the newest member of the GPD when he is there. And Basco gets plenty of attention when he is at home with the Johnson family. Johnson said the response from the Galion community has been incredibly supportive, with many local groups stepping up to help support Basco financially. Just last weekend, the Galion chapter of the League of Riders Motorcycle Club held a fundraiser to help with costs for Basco. LORMC had a goal of $1,000, and exceeded it with a total of $1,5o8 raised by the end of the night. Johnson said the money will likely go towards a ballistic vest for Basco along with other needs. Galion American Legion Scarborough Post 243 also has played a role in getting Basco into the GPD fold. Galion Police Chief Brian Satterfield coordinated the fundraising efforts of approximately $16,000 to form this unit, at no cost to the city. Among the contributors has been the TNT Bar, League of Riders Motorcycle Club, Galion Elks and Galion AFSCME Union. While the procurement and initial training of Basco was funded through donations, Satterfield was still approximately $3,000 shy of the target. Local Legionnaire Ken Green, finance officer of Galion American Legion Scarbrough Post 243, heard of the shortfall and contacted Chief Satterfield for more information. On Sept. 10, Green took the matter to the Galion Legion’s executive board and in less than two minutes the $3,000 was approved for disbursement to Satterfield. Galion Police Officer Tim Johnson is pictured with his new K9 partner Basco, a Belgian Malinois who patrols with him and lives with his family. 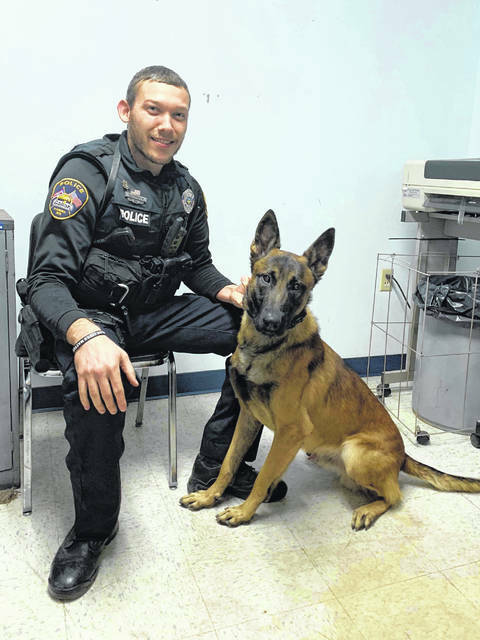 https://www.galioninquirer.com/wp-content/uploads/sites/38/2018/11/web1_basco.jpgGalion Police Officer Tim Johnson is pictured with his new K9 partner Basco, a Belgian Malinois who patrols with him and lives with his family.